Which Candidates Are Taking Uber to Luxury Hotels? We crunched the numbers on how candidates spend on the campaign trail. Campaigns have spending habits, just like people. And what a 2016 contender buys can say a lot about what they stand for—even if it’s just booking a hotel room. 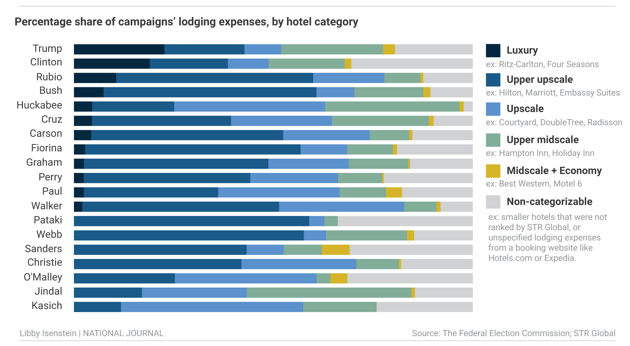 National Journal took a closer look at two areas of campaign expenditures—taxis and hotels—to see how campaigns vary in which brands they use the most. When a presidential candidate needs a ride, who do they call? Most of the time, Uber. Payments to the ride-hailing app account for three-quarters of all campaign spending on taxis. Of the 17 candidates with available data, five didn’t even report a single traditional taxi charge—that is, nothing with “taxi” or “cab” in its name or description. 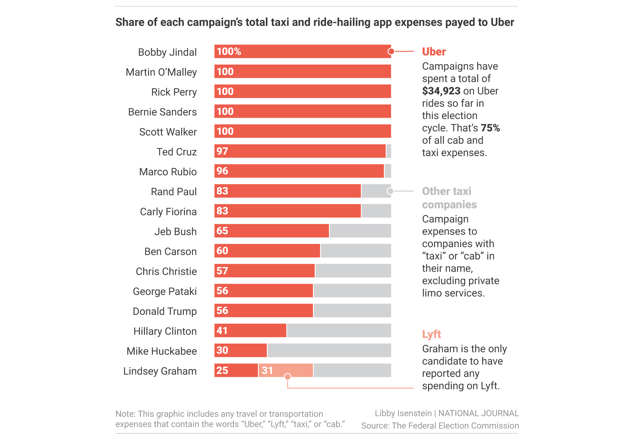 And only two candidates—Hillary Clinton and Mike Huckabee—spent more on traditional taxis than they did on Uber or Lyft. Lindsey Graham’s campaign is, in fact, the only one to have used Lyft, a popular competitor of Uber. Lyft rides accounted for 31 percent of Graham's taxi spending. The only other ride-hailing app used by any campaign was Curb. Ted Cruz listed a single $21 charge—too small an amount to highlight on its own. That ride is included in Cruz's “other taxi” total. This analysis didn’t look at hired car services or limousines, which see plenty of use on the campaign trail. The most common hotels for campaigns on the road are predictably Marriotts, Hiltons, and the like. Within each campaign, there is a bit more variety. 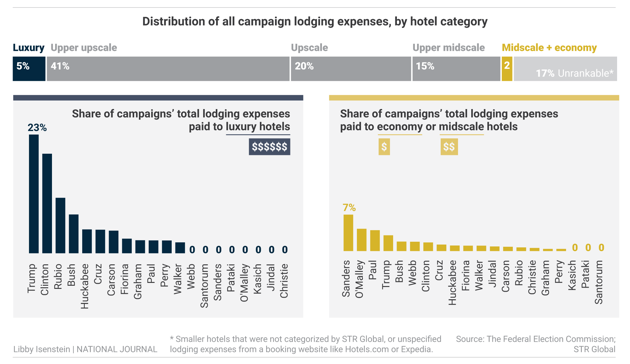 Using categories provided by STR Global (a travel research company that releases standardized data on all major hotel brands in the United States), we were able to map out each campaign’s spending habits by hotel class. In other words—which candidates splurge for luxury and which tend to take more modest options? Team Clinton has logged nine stays with Ritz-Carlton, while Rick Perry and Huckabee each reported one visit (and zero for the rest). Not surprisingly, Donald Trump is the only candidate to lodge at a Trump hotel. Meanwhile, Bernie Sanders’s campaign is the only one to book a Motel 6. Despite pouring a large chunk of its lodging money into luxury hotels, the Trump campaign’s hotel spending is one of the more evenly distributed across quality tiers. Bernie Sanders’s campaign has the highest percentage of funds spent at midscale and economy hotels. And there are a handful of candidates who have never booked a luxury hotel brand. Since the start of 2016 election cycle, across all campaigns, a cumulative $20,000 has been spent on flags, at least $46,000 on music licensing, and at least $5 million on postage.